May | 2013 | LIT.GAZ. It’s about the assassination of Heydrich, by the Czech resistance, in 1942, the background and the consequences. So, at some level it’s historical. And the author repeatedly underlines his research for factual accuracy. It’s very detailed: you would say the couleur locale is very well executed. 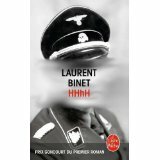 But it’s also about the author’s fascination with the personality of Heydrich, the events and the personalities, and his own life and decisions keep intruding. This slows down the pace, introduces some reflectiveness, and also develops some suspense and tension. But I kept on thinking, do I want to know about his love life and relationships with Czech women – why is he inserting all this extraneous matter? At that level it becomes as much a book about him, his quest and his fascination. Fair enough, but it was also frequently irritating. How to deal in a new way with old material that has been used and re-used many times already? Well, I suppose this is one of them, and he did keep me reading. But there was constantly this ‘look at me, I’m doing something so new and wonderful’, along with the putting down of others who’d tackled the same or similar material. To dismiss a novel like Littell’s Les Bienveillantes in a line was witty but gratuitous. Then I thought, well, okay, I’m of a generation that knows quite a lot about the Second World War and Nazism, and there are other people who don’t, younger generations who need to be informed, and this is a way of communicating the insanity and horrors of the time with them. It’s a history book without being a history textbook, as it were. In the end, I’m glad I read it, and it kept me engaged. But I’m not sure whether it would bear a second reading, without seeming unbearably precious. Ask me in ten years. This is a difficult book, and a challenging one, but good, and I shall be re-reading it shortly, now that I’m clearer what his approach is. I read it because I like silence, and feel oppressed by the gratuitous noise that pervades so much of the modern world. I want to flee bookshops like Waterstone’s as soon as I pass through the door, because of the awful music that they play – presumably to encourage people to buy books? I read it because I enjoyed Sara Maitland‘s book on silence, and will be returning to it, and I read it because I’m a Quaker and we worship in silence. Diarmaid MacCulloch explores the place of silence in a wide range of different Christian churches and their rituals over time, and its gradual disappearance in favour of ritualised worship and liturgy. He shows why religious leaders were suspicious of silence and where it might take worshippers, and he recognises the deep spiritual potential of silence. His approach is a thoughtful, enquiring and sympathetic one, although he pulls no punches in the later parts of the book where he explores issues and topics that the established churches have deliberately remained silent when they ought not to have done. He recognises that his background and expertise mean that he is focused on Christianity and its traditions, and that there is much that might be said about silence in other faiths. I have found his earlier books, on the Reformation, and on the history of Christianity, very interesting and thought-provoking, and this was no exception, although harder to get into initially because of the elusiveness of the concept. But it repaid perseverance. 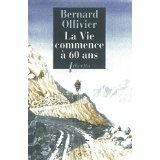 I’ve written about Bernard Ollivier’s epic walk along the Silk Route in earlier posts; this is more personal and biographical, and explains more of his thinking about life. I decided to read it as I approach the ‘six-0’ in a short while, and I found it quite inspirational. One of his major ideas is that walking solves everything, and I agree with him: he discovered this by walking from Paris to Santiago di Compostella in Spain, and I read his book while on a walking holiday in the hills of Luxembourg. He explains how he came up with the idea of walking the Silk Route, how he planned it and the reactions of family and friends to the exploit. There is honesty in the way he approaches ageing and its inevitable effects, and coming to terms with these; plenty of material for thinking about here. Above all, it’s an attitude of mind which I’d hope to emulate. One can’t escape growing older and gradually weaker, but one doesn’t have to be oppressed by it; being retired brings opportunities and freedoms along with it. I’m re-visiting some of Shakespeare‘s plays in advance of a course I’m going on in a few weeks’ time. I remember that years ago I used to describe this play to my school classes as ‘Shakespeare’s video nasty’, and my opinion hasn’t really changed. It fits clearly into the revenge tragedy mode, with the hero driven to extremes, plotting his revenge for the wrongs done to him by others, feigning madness and perhaps also losing his sanity in the crazy world into which he is drawn. In the same time-frame, I think Kyd did better in The Spanish Tragedy, and later, Shakespeare clearly did better with Hamlet. The most annoying thing for me in this play is the thinness of the characterisation, redeemed only by Aaron as a clear fore-runner of Iago. But, I am looking forward to discussing it, and even more, to seeing it in performance.